Ever wonder what a garden hose is thinking? Do you quiddle with words? 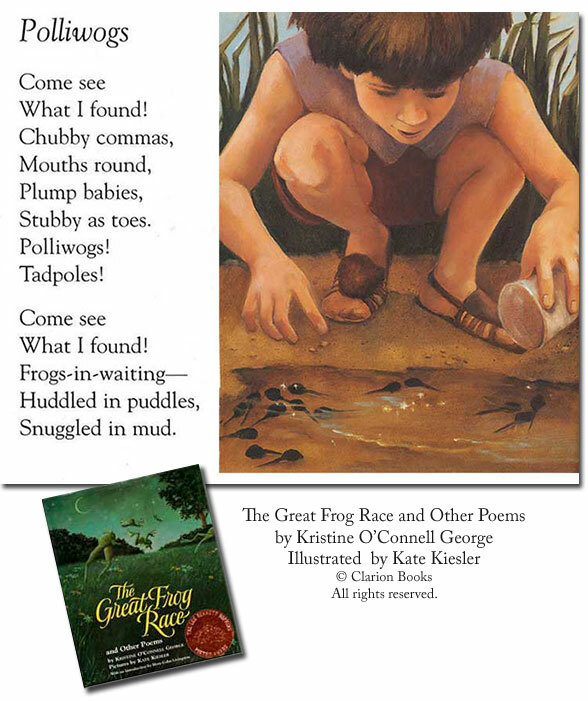 From frogs to polliwogs to monkey wrenches and waterbugs... Rich in imagery, figurative language, and a wide variety of poetic forms, this is a collection to simply enjoy or use when aligning curriculum with the Common Core State Standards. "An invitation to experience joy and wonder." Starred review, Publishers Weekly"
See the Teacher's Guide for writing exercises. 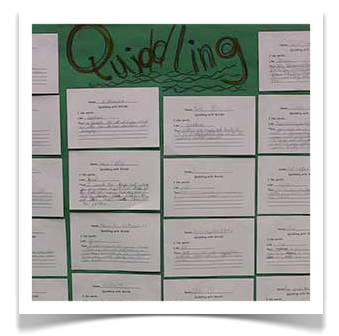 Quiddling included! 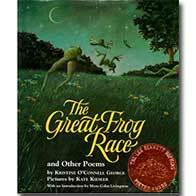 The Great Frog Race was my first book and these twenty-eight poems were written over a period of about five years. Now in a 4th printing, The Great Frog Race was also translated into Braille. My grandfather was legally blind and I'm especially thrilled to know my poems will be available to children who are visually impaired. The poems in this collection — many written while I studied with Myra Cohn Livingston - celebrate memories of my childhood: tadpoles, shooting stars, and an old farm dog named Zeke. There are poems about singing off-key, getting lost with Mom, and a drowsy day-dreaming garden hose. When I share my book with children I often bring my (very elegant!) metal bucket with "props" from some of the poems: One egg (plastic!). A length of garden hose. A well-preserved dragonfly. A sprig of lavender. Maracas. A saltine cracker. A monkey wrench... In talking to students, I hope to demystify poetry and help them understand that poetry is all around them, even in the humble ordinary objects in our everyday lives. Kate Kiesler captured her own childhood memories in oils, and The Great Frog Race was the beginning of our collaboration. Our subsequent poetry collections are Old Elm Speaks: Tree Poems and Toasting Marshmallows: Camping Poems. Kate and I hope you enjoy The Great Frog Race.